The costal city of Vancouver is a true economic powerhouse. Home to Canada’s busiest and largest port, Vancouver is the nation’s gateway to the Pacific Rim, trading more than $43bn worth of goods each year. Boasting four percent GDP growth in 2016 and creating 60,000 jobs over the past 12 months, the seaport city is one of North America’s fastest-growing economic hubs. In addition to its key role in international trade, the Canadian metropolis also has a thriving knowledge economy. Thanks to the city’s array of top-rated universities and tech clusters, Vancouver’s hi-tech sector is flourishing, with a host of global technology companies choosing to establish a presence in the area. From tech start-ups to established video game developers, the city caters to tech workers of every level. While it might be too soon to call Vancouver the Silicon Valley of the north, the city is certainly emerging as a world-class hub for innovation. With its pleasant climate and close proximity to both beaches and mountains, Vancouver consistently ranks among the best cities in the world in which to live and work. It will come as no surprise then that Vancouver is now one of the world’s most popular business destinations, and is home to a flourishing MICE industry. 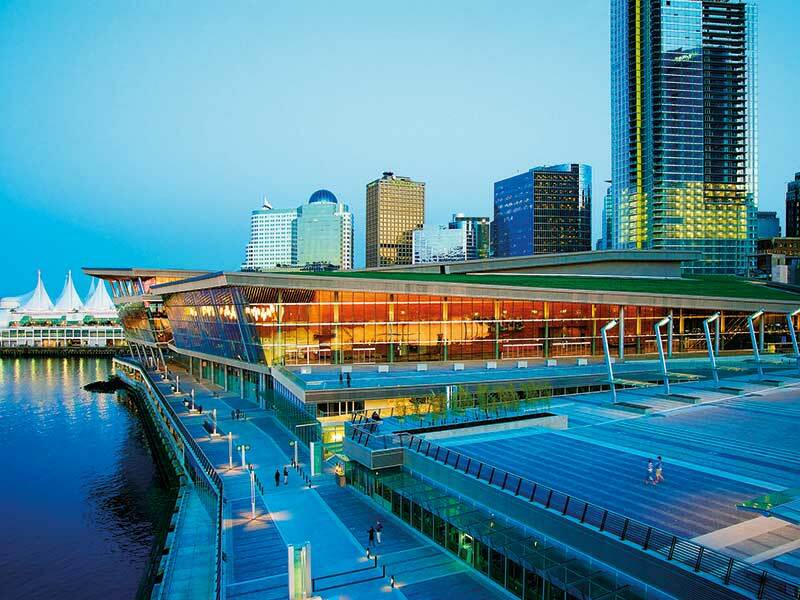 Though there are a host of spectacular venues to choose from in the city’s vibrant downtown core, one truly stands out from the rest: located on the stunning waterfront, the Vancouver Convention Centre offers one of the most beautiful events settings in the world. The state-of-the-art building is nestled against a dramatic mountain backdrop, combining modernity with nature in a perfect architectural representation of what the city has to offer. The breathtaking venue is internationally recognised as one of the world’s leading convention centres, hosting more than 500 events annually across its impressive 466,500sq ft of meeting space. In 2010, the venue was propelled into the global spotlight when it was chosen to be the main media centre for the Vancouver Winter Olympic Games. Over the course of the games, the centre welcomed more than 10,000 journalists and broadcasters from around the world, and a majestic 10m-tall Olympic cauldron was lit just outside the world-class venue. Today, the Olympic cauldron remains as a permanent fixture at the centre, serving as a constant reminder of the city’s Olympic legacy. What’s more, the magnificent feature is also a testament to the venue’s ability to effectively host large and complex international events. Canada has long been a pioneer when it comes to environmental sustainability, and Vancouver has set itself the ambitious target of becoming the world’s greenest city by 2020. The costal city already has the lowest per capita greenhouse gas emissions of any major city in North America, with more than 80 percent of its energy stemming from renewable hydroelectricity. It is fitting, therefore, that Vancouver’s leading conference centre also reflects the city’s eco-friendly vision. Environmental sustainability is incorporated into every aspect of the building’s design, with the venue boasting a sprawling six-acre ‘living roof’. The green roof – the largest in North America – is home to more than 40,000 indigenous plants and grasses, as well as four beehives full of 60,000 European honeybees. Inside the venue, meanwhile, the centre’s kitchen is dedicated to using fresh local and seasonal ingredients in all of its delicious dishes. For instance, the centre’s own bees provide the restaurant with fresh organic honey. By sourcing the finest locally grown produce, the venue is able to significantly cut down on its energy consumption. The centre also recycles around 180,000kg of materials annually, while donating any leftover food to local charities. These efforts have not gone unnoticed by the international community, and Vancouver Convention Centre is today recognised as one of the world’s most eco-friendly meeting venues.